Metallica are sharing video highlights from their appearances at Neil Young’s 30th anniversary Bridge School Benefit Concerts last month. “We dusted off our acoustic gear, stripped down some classic songs, played some covers and even jammed with our host, the man himself Neil Young,” says the band. “Live recordings of both shows are now available on CD and as a Digital Download in the Met Store. All net proceeds from the sales of these shows will be donated directly to the Bridge School. “To help you re-live the show we also have some videos from each night that we’d like to share with you including covers of The Clash’s “Clampdown” and Buffalo Springfield’s “Mr. Soul” featuring Mr. Neil Young himself. 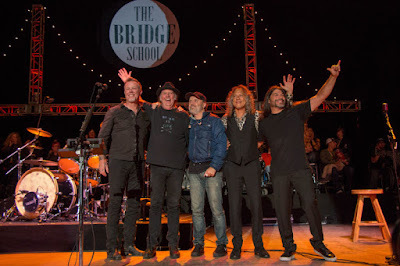 Metallica, Roger Waters and Dave Matthews were among the performers at the annual weekend event, which sees musicians play stripped-down acoustic sets as they raise funds for the school supporting education for children with disabilities. You can help the Bridge School with your donation here.